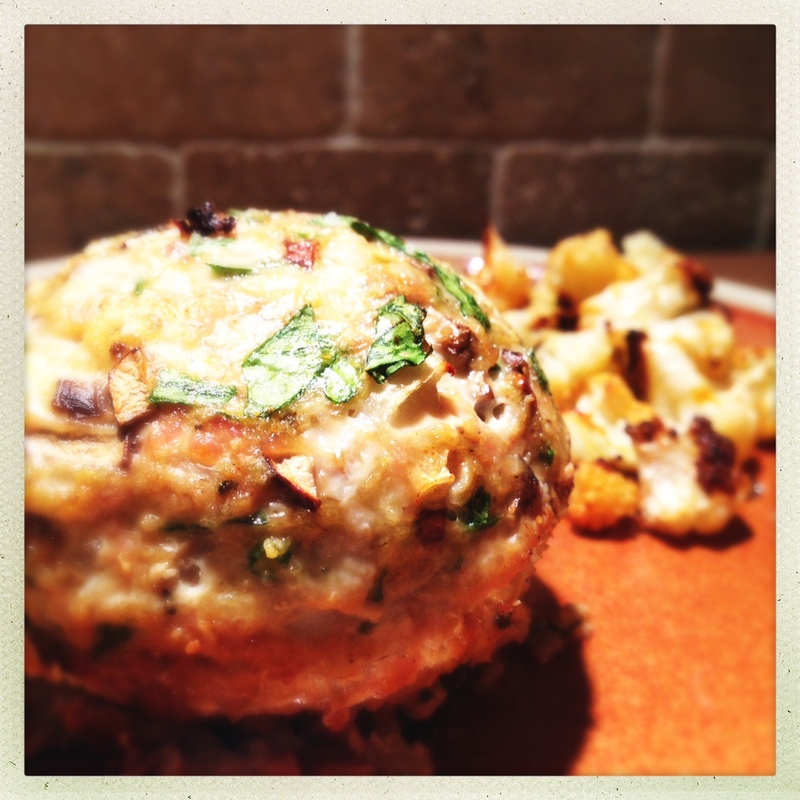 I realize I’m not exactly breaking new ground here with yet another chicken meatloaf muffin. In fact, this is really just a tweak of the original meatloaf muffin that got the idea for this blog going in the first place – although the photography has gotten much better than those early posts. In addition, as the parenthetical in the title states, these muffins are made “by hand.” What I mean by this is that I have foregone the gadgetry of my trusty chopper and prepped all the meatloaf ingredients myself. This came about as a combination of the demise of my favorite chopper, and the fact that I recently received a brand new Wüsthof santoku knife from Mrs. Eats For All Ages for our anniversary. 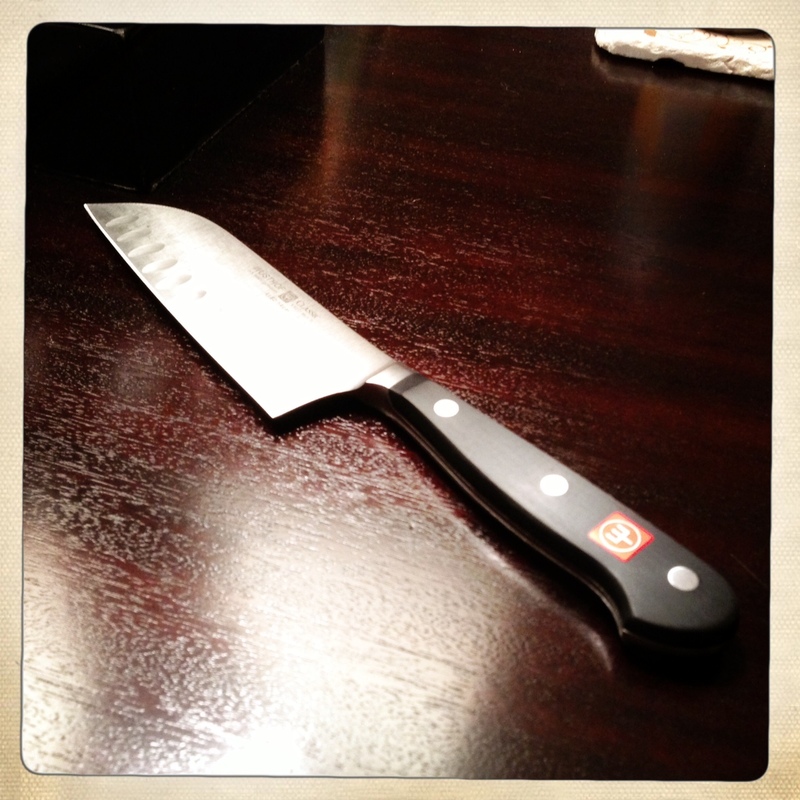 The difference between a good knife and a great knife is immeasurable. This knife made quick work of anything I threw at it, but more on that to come. 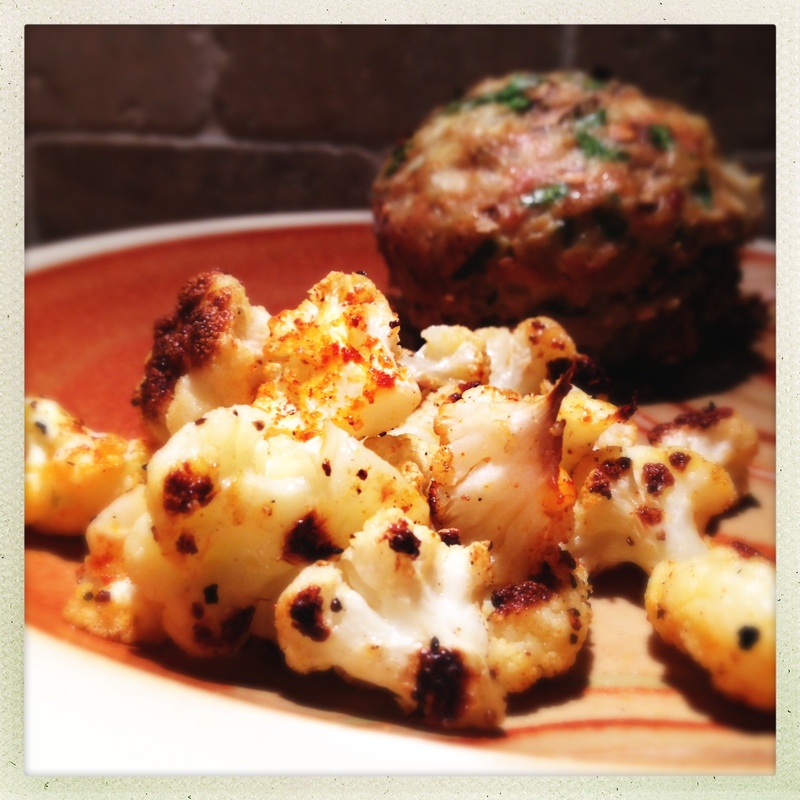 In addition, the roasted cauliflower side outlined here is a vast improvement over the steamed frozen veggies present in some of the earliest posts. 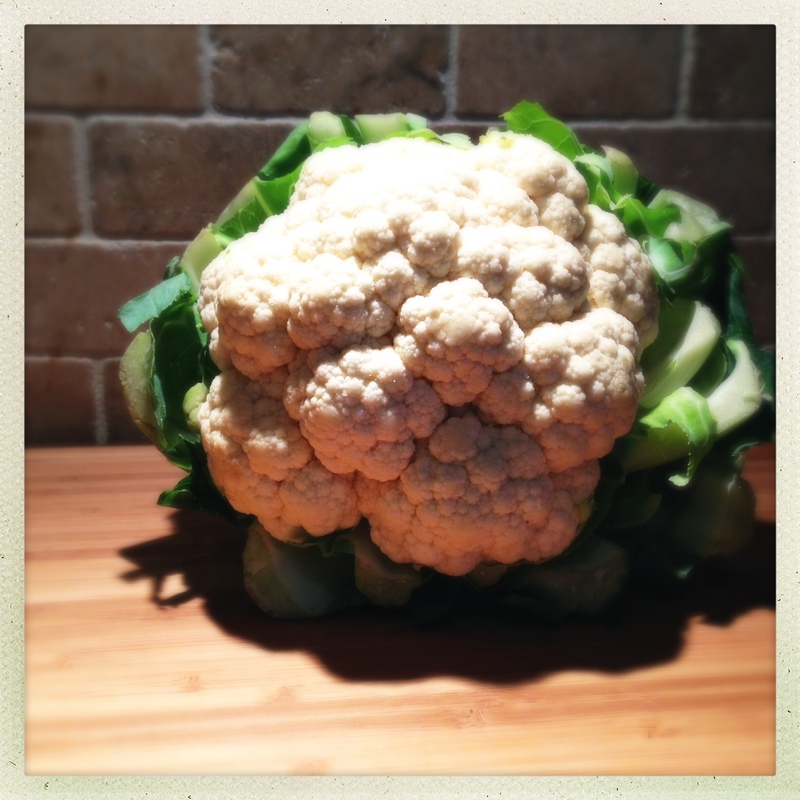 Our little guy loves it, and cauliflower is pretty much made for roasting. 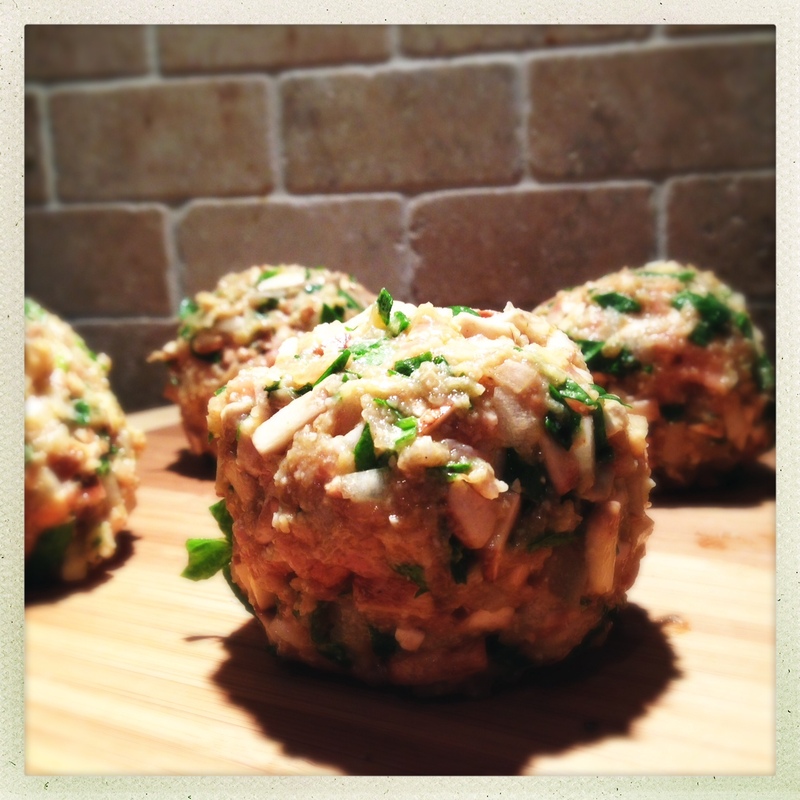 So, almost a year after the first meatloaf muffin was posted, we have made some big strides – Let’s get started! Preheat your oven to 400 degrees while prepping the ingredients. Since we’re making these muffins “by hand,” I will refer to all the mincing work being done with a knife, but this can of course be done in a chopper or food processor to save time. In the end, I appreciated the reduced clean-up of doing this all with a knife. I also felt the consistency and texture of the meatloaf was more due to the larger mushroom pieces. First, place the ground chicken into a mixing bowl. Cover with the worchestershire sauce so that the flavors mingle while you’re mincing/chopping the other components. While the meat is soaking up the worchestershire, mince the onion. Size is up to you. I went for a fairly small mince to allow the onion to cook quickly in the meatloaf and disperse more flavor. Next, we’ll deal with the mushrooms. I sliced the stems flush with the caps so they would sit easier on the cutting board. 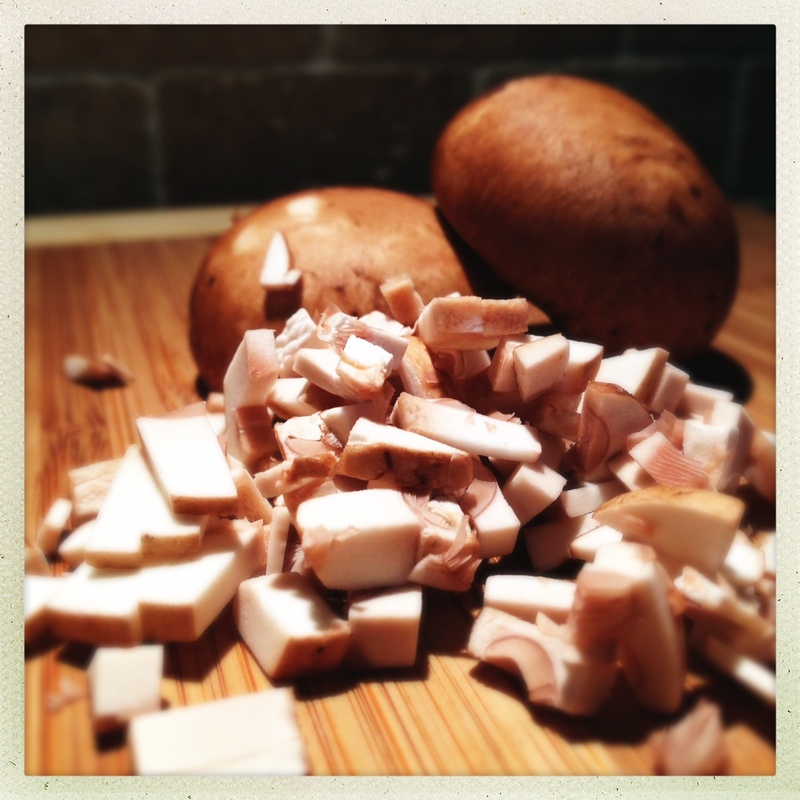 I sliced each mushroom horizontally (like slicing a burger bun) and then sliced in both directions from the top. Again, size is up to you. I went about as small as I could, which still left much bigger pieces than the chopper or food processor, but small enough that they easily mixed in to the meatloaf mixture. Add the mushroom and onion to the mixing bowl. Finely chop the baby spinach and mince your garlic cloves. Add these as well. Cover with the bread crumbs and parmesan. Add the smoked paprika (optional, but delicious), salt and pepper. Add the egg and gently work the meatloaf mixture together. You don’t want to over work it, just mix it until everything is evenly distributed. When it comes time to add the meatloaf to the muffin pan, I like to divide the meat into balls on a cutting board before placing them into the muffin pan. This lets me easily distribute the mix evenly without having to pluck any meatloaves back out of the muffin tin. Drop the meatloaf balls into the muffin pan, but don’t press them in. They’re easier to get out if they’re not pressed in too firmly. Place them into the oven. 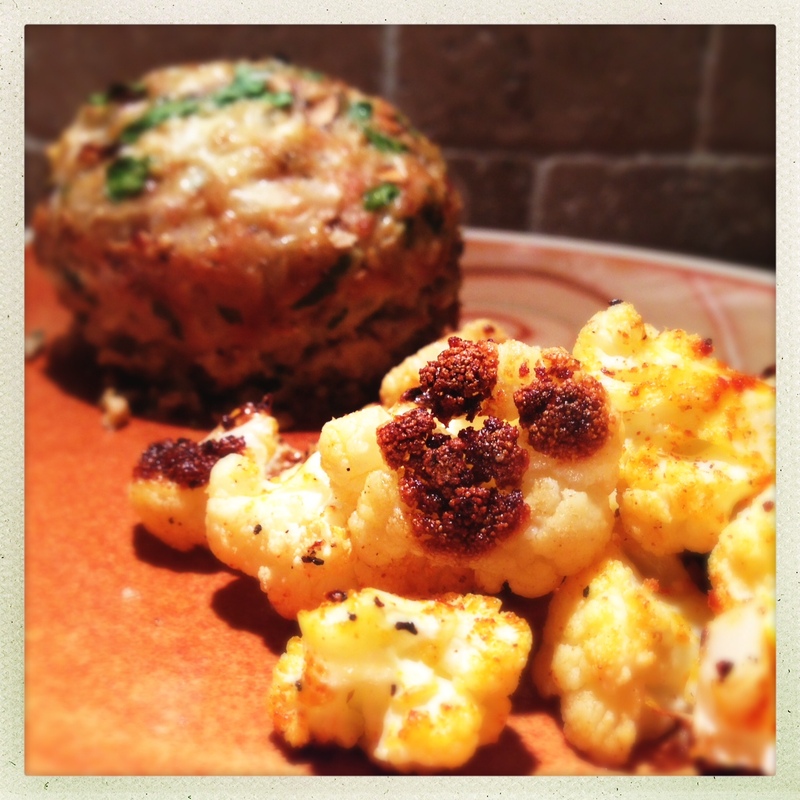 The meatloaves cook for 30-35 minutes and the cauliflower cooks for 20-22 minutes, so you have a little time to prep the cauliflower while the meatloaves start to cook. First, remove all the green leaves/stems from the cauliflower. Next, cut it in half. 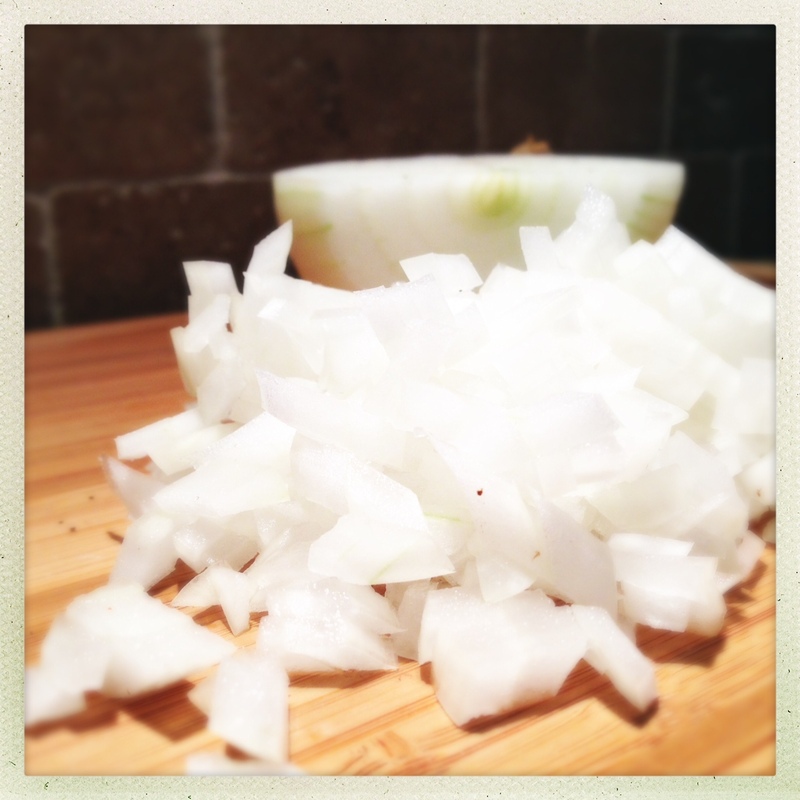 Using a sharp knife, remove the large stalk from the center so that you have mostly the floret tops left. 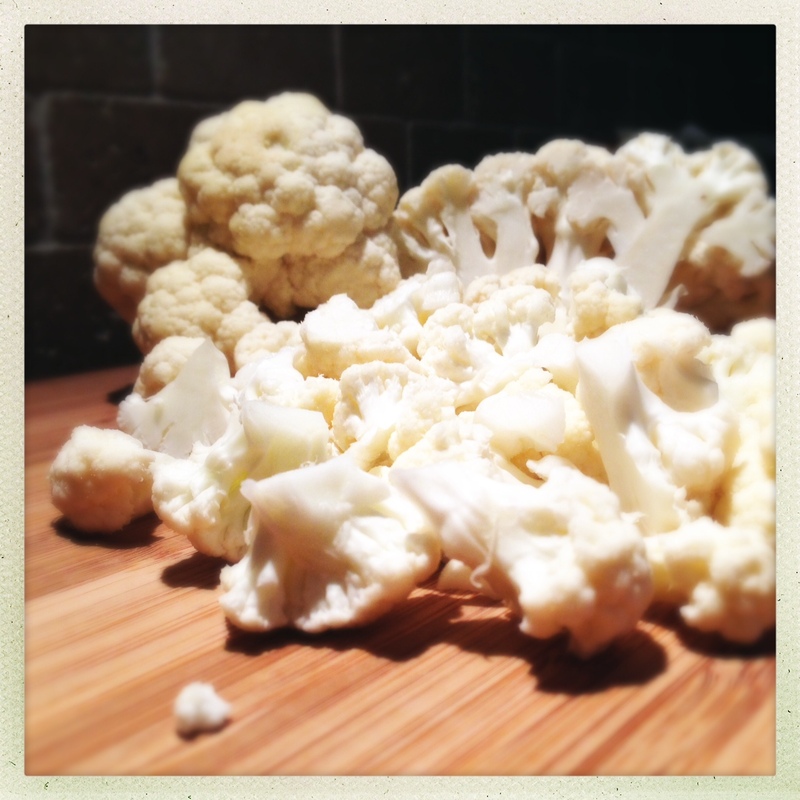 From this point, you can continue working with the knife and roughly chop the cauliflower into smaller pieces, or you can break it down by hand. I typically do a combination of both, using the knife to slice off the thicker stalks and then breaking the remaining cauliflower into smaller pieces to roast. However you do it, you’re looking to make pieces about an inch in size so that they will cook quickly all the way through before the outside starts to burn. Place the broken down cauliflower pieces into a zip top bag with a little drizzle of olive oil and shake to evenly coat the vegetables with the oil. 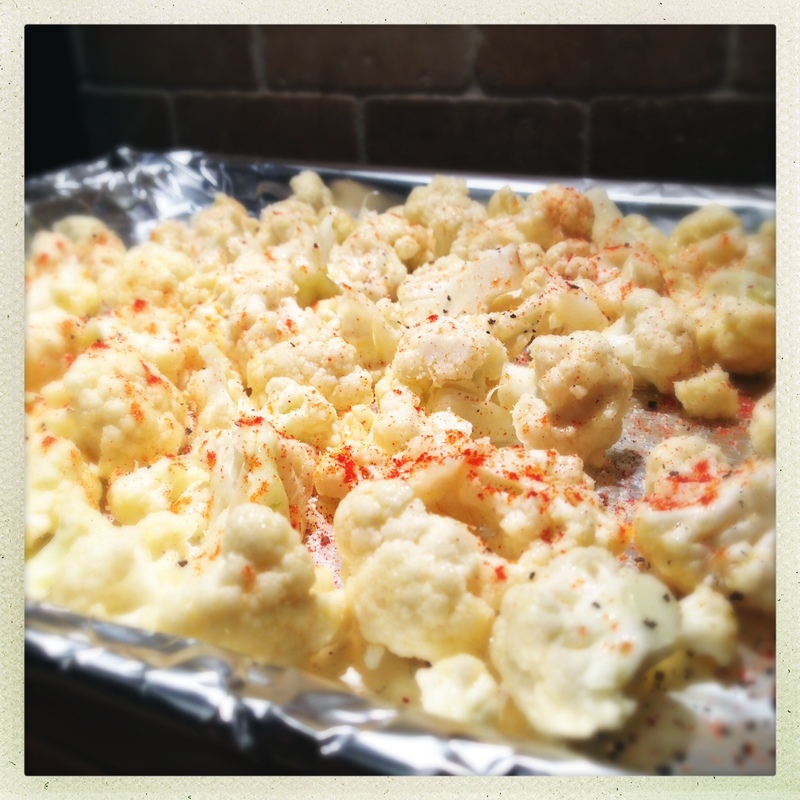 Spread the oiled cauliflower evenly on a baking sheet (I use a foil lined sheet for easy clean-up). Season with salt, pepper and a little smoked paprika The smoked paprika is the unifying flavor this time around – a nice smokiness in the background, but not overpowering, and it brings the meatloaf and the cauliflower together. Prepping the cauliflower usually takes me about 10 minutes, so by the time it’s all set, it’s usually ready to go into the oven so that both the vegetables and the meat come out at the same time. Keep in mind, though, that the meatloaves can easily rest up to 10 minutes after coming out of the oven, so don’t rush when cutting up the cauliflower (that’s how people get nicknames like Mr. Eight Fingers). Meatloaf is one of the great comfort foods – it can be nearly anything, and it’s a great blank canvas for trying new flavors. I still make these at least 3-4 times a month with different ingredients, and I never get sick of trying new things and going back to family favorites. They’re warm and inviting with the first bite, and they make a delicious lunch or snack cold the next day. The cauliflower really works well here, too. It gets nice and tender while maintaining a little firm crunch, and nothing compares to the roasty flavor of vegetables that have been browned in the oven. This may not have been a groundbreaking post, but hopefully a little new technique combined with improved photography make this round of meatloaf muffins a favorite in your home as they are in mine. Our little guy asked for seconds of everything – and he’s lucky I didn’t get to it first. Enjoy!